Duoloc single ferrule OD compression fittings are designed to be robust, yet quick and easy to assemble and have been extensively used for onshore applications for over 35 years. These include instrumentation for gas control systems, gas R&D systems, process control for chemical plant and general hydraulic industries. The fittings are resistent to vibration, providing ease of assembly (controlled bite), break and remake facility and offer full material cast code traceability. The Duoloc product is available in 316 stainless steel and a comprehensive range of metric and imperial sizes and thread forms. Most Duoloc fittings can be adapted to work with glass or PVC tube and can be modified to suit thermocoupling applications. Easy and safe make-up of joint with no galling of the threads during assembly. Provides repeated break and remake of fitting without thread damage. The tube end is positively located in the tube abutment, thus preventing excessive misalignment of the joint during installation. The ferrule swage protects the tube bite from vibration and prevents excessive stress being transmitted to the tube All exposed threads are protected with colour coded plastic caps. The Duoloc gauging system ensures the fitting has been assembled correctly and that the tube has been fully inserted into the abutment. All materials are traceable to original mill certs. All materials are 316 Stainless Steel with a hard casing to the ferrule. The close tolerance manufacture ensures full interchangeability of Duoloc components. The Duoloc fitting fully complies with the Transco F9 specification. Assembly instructions for 316 stainless steel 1/8″ OD and 3/16″ compression couplings for stainless and nylon tubing. Tube to be seamless, annealed to max hardness of HRB 90. Tube should be cut to length with ends prepared as square as possible, all burrs removed. Prior to assembly, the nut and ferrule should be removed from the body, placed over the end of the prepared tube and the ferrule contacts the ferrule adaptor lubricated. The end of the tube should then be inserted into the body of the coupling, taking care to ensure that the tube butts firmly onto the abutment shoulder. Tighten the nut until the ferrule is felt to grip the tube enough to prevent the nut a further 1 turn. Fittings can be broken and remade without impairing the function and efficiency of the joints. Disassemble and gauge the Assembly. Prior to re-assembly ensure that the fitting body and tube assembly are free from any containment or damage. Insert the tube assembly into the fitting body until the ferrule seats firmly. Tighten the nut until original assembly position is rached then tighten the nut a further small amount to ensure the assembly is positively sealed. Waverley are able to offer a wide range of gauge adaptors with most combinations of male and female threads available to be supplied ex-stock. Any items not available as standard can be manufactured as specials. Our recommendation is that as a majority of gauges are supplied with a male thread, screw a female standpipe adaptor on to the gauge. 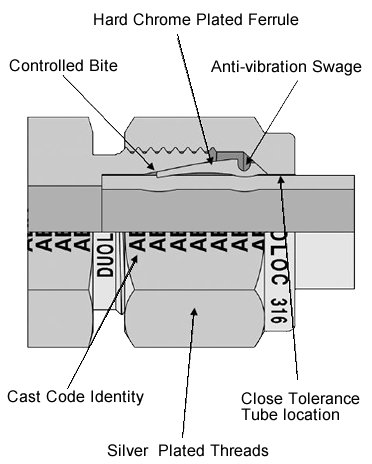 Then, depending on the other connection, either a male or female stud coupling can be assembled to the standpipe to leave the required thread. This gives you the added benefit that by loosening the compression joint the gauge can be positioned facing the required direction. Most of Waverley’s range of male and female stud couplings are suitable for use with thermocouples or any other type of probe that needs to pass right through the fittings before being locked in place by the compression ferrule. At the time of order just inform our sales staff that the fittings are required for use with thermocouples. A slight modification is then required to the standard component. This modification only adds one or two days to the delivery time. The only instance where this modifcation is not possible is if the thread at the opposite side to the compression fitting is too small to allow a sufficient bore through the fitting. NB Boring through compression fittings in the above way can reduce pressure ratings. Please contact our sales team for information. Most of Waverley’s range of male and female stud couplings are suitable for use with thermocouples or any other type of probe that needs to pass right through the fitting before being locked in place by the compression ferrule. The only instance where this modification is not possible is if the thread at the opposite side to the compression fitting is too small to allow a sufficient bore through the fitting. supplied ex-stock. Any items not available as standard can be manufactured as specials. Waverley brownall stock a wide range of 316 Stainless Steel Seamless tubing to ASTM A 2-269 in both metric and imperial sizes. The range of tube coincides with the Duoloc range of Single Ferrule Compression Fittings and can be cut to any length subject to a minimum of 1M. The tubing should be solid drawn and fully annealed to ASTM A-269 or equivalent. A maximum hardness of HRB 80 is preferred, but if harder tube is used the HRB 90 should be the maximum allowed and specified. 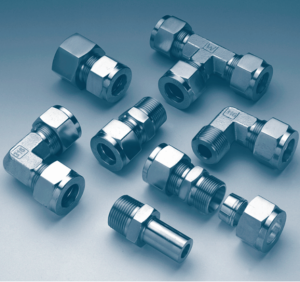 The working pressures in the following tables are for Duoloc Single Ferrule connectors and are based on tubing rated at 75,000 psi minimum UTS and allowable working stress of 20,000 psi as specified in ANSI B31.3.1987 for a temperature range of -29° to +38°C. Using single ferrule OD compression fittings with nylon and other soft tubing. Waverley’s single ferrule OD compression fittings have a unique design feature which allows you to assemble the compression joint in the normal way without the need for a tube insert. Single ferrule compression fittings will work perfectly with most types of soft tubing as the tube has a wall thickness of 1mm or above. If the compression fittings are to be used with glass tubing, PTFE ferrules can be supplied. NB Wall Thickness of soft tubing must be a minimum of 1mm. For our full range of Duoloc Imperial & Metric PDF charts click here. For more information, get in touch with Waverley Brownall today.